The Liberty 18 in. Self-Closing Drawer Slides (2-Pack) enable you to put together a functioning kitchen cabinet drawer that holds up to 100 lb. The pack contains 2 slides and the needed hardware. The slides are designed for easy installation. 22 inch Ball Bearing Drawer Slides The Liberty 22 in. Ball Bearing Full Extension Drawer Slide is intended to help build a drawer or update an existing drawer. This drawer slide is made of steel and has a zinc-plated finish. Mounting hardware included for easy installation. 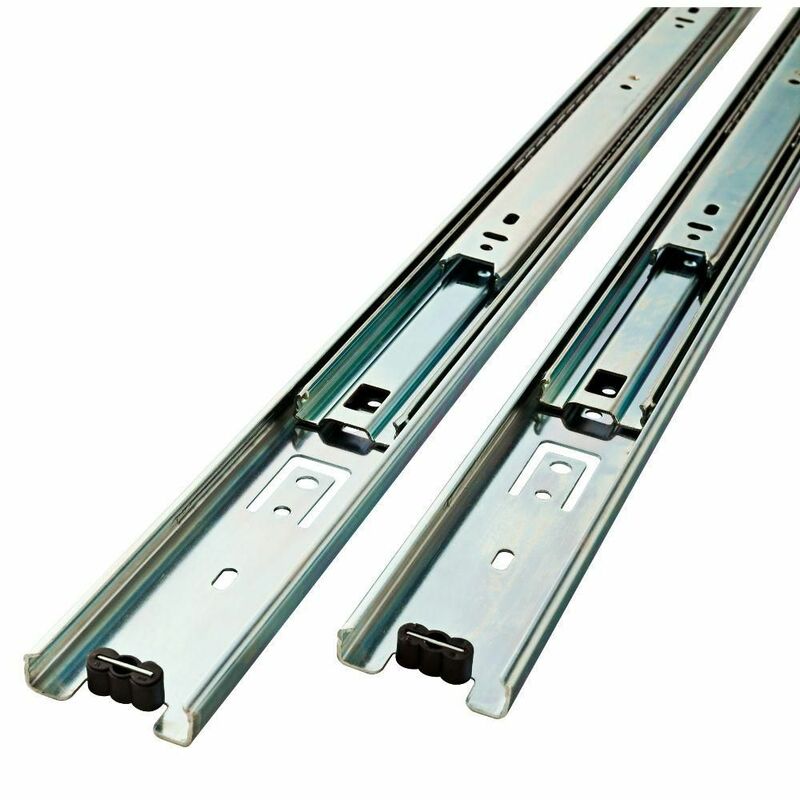 22 inch Ball Bearing Drawer Slides is rated 4.3 out of 5 by 49. Rated 5 out of 5 by CanDo from Seem just as substantial as the more expensive glides. No... Seem just as substantial as the more expensive glides. No screws were included in packaging. Calls for six #6 1/2” per glide. Rated 4 out of 5 by Paul from A good price for the pair of tracks. They run... A good price for the pair of tracks. They run fairly smooth, but not as well as some of the more expensive ones that sell for twice the price. A good value over-all. Rated 1 out of 5 by Joseph from Very dissapointing i bought 8 of these and returned 7. Had to buy the holding brackets separately (not told in the first place) but the brackets were useless. They are a 'pocket' bracket that the cabinet slide sits in. The drawer then would not close all the way, and I had to cut off the inner side of the bracket to make it work. So, I have one in use out of the eight. Engineering design of the bracket is very poor. Not recommended. Rated 1 out of 5 by Betty from ordered 23 drawer slides. One has a manufacturer's defect.... ordered 23 drawer slides. One has a manufacturer's defect. Hoping I can exchange it at the local Home Depot store. If I must return it on line I will be extremely disappointed because I don't want to wait 2 weeks or so to have my drawer slide that I "Need Now." Rated 5 out of 5 by Brad from Just as strong and smooth yet less expensive than Accurides.... Just as strong and smooth yet less expensive than Accurides. What is rated load of these slides when fully extended to 22&quot;? HI,&nbsp; Can anyone tell me if this is a single drawer slide or a pack of two like other products? can these be used to install flat boards in cupboards &nbsp;to use pull out shelves? Am considering this style of glide hardware for storage boxes for 45rpm records so need some idea how much weight these glides can tolerate before bearings or other parts are damaged. I'm trying to create a simple slide-out platform for a deep cupboard shelf. Could I use a couple of these mounted on the bottom of the shelf with a plank affixed to the top?